After hanging around festivals and burners for a bit I decided that it was finally time to show my stuff and actually build one of these crazy fire cannons everyone is always talking about. 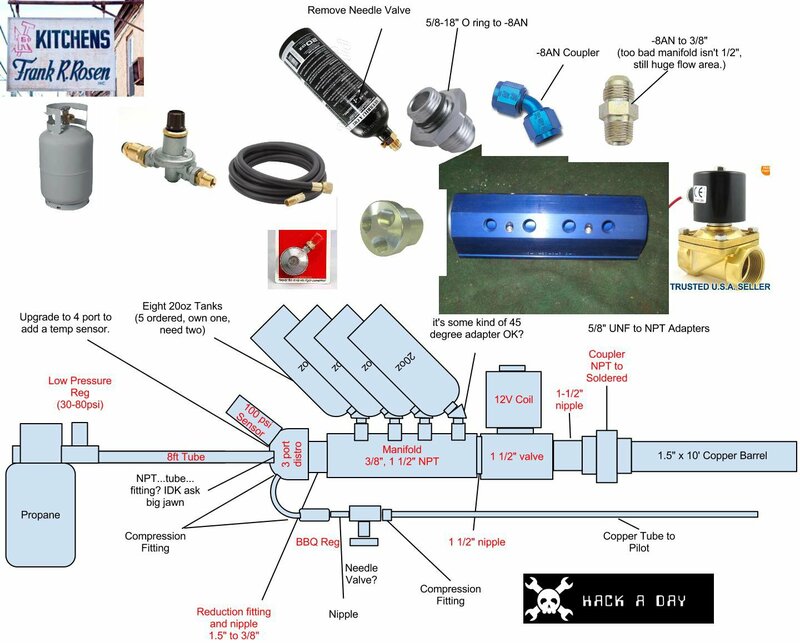 The easiest way to go about this would have been to just follow plans from any given website: replace the valve from an empty grill tank with a 4 way fitting, add an electric solenoid, barrel, low pressure regulator (for the pilot), and then pipe in a regulated propane source. Easy. 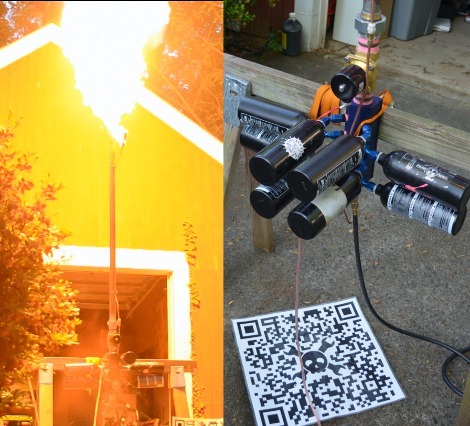 The problem My problem with this stock fire cannon design is that it looks like every other fire cannon out there, you have your off the shelf propane bottle and a long thin copper barrel poking up from it, the fire is nice but the cannon is not very fun to look at. Also you can only fit a given size valve, and that does not allow for very much fuel to be released at once. This limits the size of the plume of fire, and where is the fun in that. The central idea is to add lots of little bottles instead of one big one; I stumbled on a nice pretty anodized aluminum water manifold and the idea grew out from there. Now, keep in mind I did not just set out to build this crazy thing out of nowhere and slap everything together without laying out some plans. I have been working with the folks over at Frank’s Kitchens for some time, and have been able to pick up a lot of safety practices and general safe handling procedure to keep myself from burning down the entire county. If you want to set out to make a flame effect that is great, but just read up on safety first and try to check out a fire cannon in person… That’s what I did and I still have most of my eyebrows as a result (no arm hair though). Enough freaking text. Check out the video below for a tour!